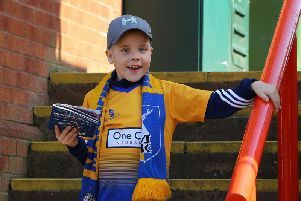 Mansfield Town’s promising start to the season came to an abrupt halt as they failed to shake their Home Park jinx with a 2-0 defeat at Plymouth Argyle this afternoon. The Stags’ winless run at Home Park stretched to 12 games as Graham Carey’s quickfire first-half double proved the difference. The last time Mansfield triumphed at Home Park was in 1978 and they never looked like being able to lift the curse. Stags recorded seven points from their opening three games to join a cluster of teams at the top on seven points. Yet they paid the penalty at Plymouth for a lacklustre first-half showing. Plymouth set the tone for a dominant first-half display on six minutes when Carey wriggled his way into the box and hit a low shot which was brilliantly pushed around the post by veteran keeper Brian Jensen. The Pilgrims took the lead after 19 minutes thanks to a rather fortuitous free-kick by Carey. Chris Clements tripped Carey and the midfield playmaker’s set-piece evaded everyone and flashed past a static Jensen and into the far corner. If the first goal had a touch of luck about it, Carey’s second was a touch of the sublime. He gathered Jimmy Spencer’s pass, turned full-back Mal Benning inside out before planting the ball past Jensen. Plymouth were not content to sit on their lead and poured forward in search of a third. Sonny Bradley headed Carey’s corner narrowly wide and Spencer brought a smart save out of Jensen at his near post. Mansfield’s best chance in the first half came in the 43rd minute after Matt Green laid the ball back for Mitchell Rose to fire over the crossbar. And when Benning’s curling free-kick looked to be on target, Bradley came to the rescue with a crucial headed clearance. The visitors finally registered a shot on target on 50 minutes, Matt Green rolling a tame effort straight at Luke McCormick. But the second half lacked goalmouth action and Mansfield were left to reflect on the first-half damage. PLYMOUTH: (4-2-3-1): McCormick 7, Threlkeld 7, Bulvitis 7, Bradley 7, Sawyer 7, Donaldson 7, Smith 7 (Purrington 90 N/A), Songo’o 7, Jervis 7 (Goodwillie 70 6), Carey 8, Spencer 7 (Slew 86 N/A). Subs not used: Dorel, Ijaha, Fox, Tanner. STAGS: ( 4-1-4-1): Jensen 5, Bennett 5, Howkins 6, Collins, Benning 5, Chapman 6, Hurst 5 (Hamilton 63 6), Rose 5 (Taft 77 6), Clements 6, Hemmings 5 (Henderson 46 6), Green 6. Subs not used: Baxendale, McGuire, Law, Hakeem. REFEREE: Brendan Malone of Wiltshire.